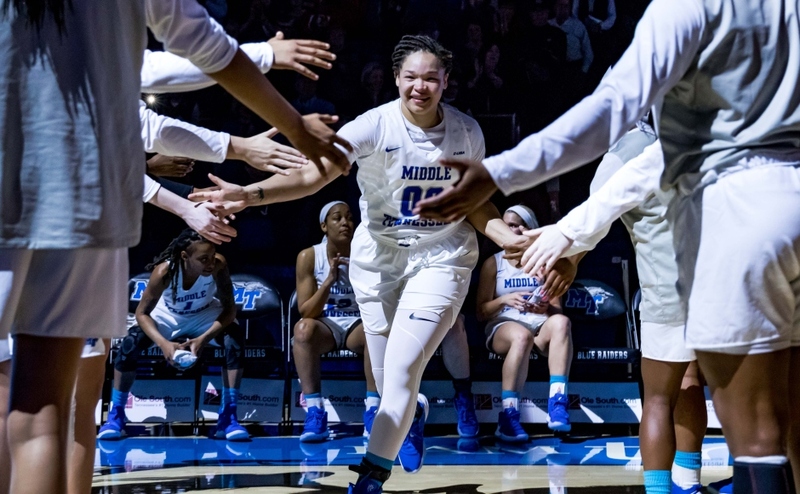 The Middle Tennessee Lady Raiders faced one of their toughest challenges of the season on Wednesday night when they played host to the fifth-ranked Louisville Cardinals. The Lady Raiders, led by a career-high scoring effort from Ty Petty, fought the entire game, but fell in the end by a score of 91-72. Right away, the height and athleticism of the Cardinals paid dividends as they built a 13-2 lead. Ty Petty appeared to get the Lady Raider offense going with five quick points to drop the deficit to five. Louisville maintained their edge by consistently working the ball inside, en route to a 22-9 lead at the end of the first quarter. 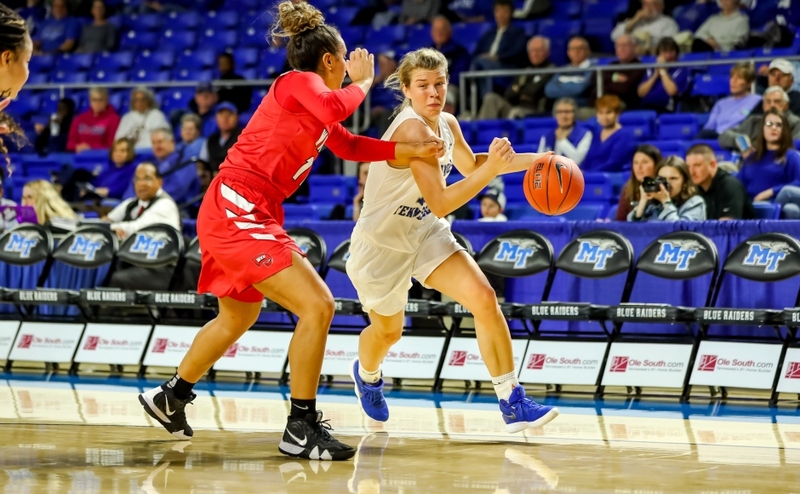 The key to the first quarter was the offensive woes of the Blue Raiders, mixed with the struggles on the defensive end. MTSU only shot 26.7 percent from the floor while Louisville shot a blistering 66 percent. The second quarter started with a big run from the Blue Raiders, as they held Louisville for five minutes without a basket. A 6-0 run, keyed by Rebecca Reuter’s solid play off the bench, cut the lead to 26-21. Louisville rallied, however, and used a 13-0 run to push the lead as high as 20 at one point. A late three from Ty Petty closed the halftime margin to 41-24 in favor of the Cardinals. 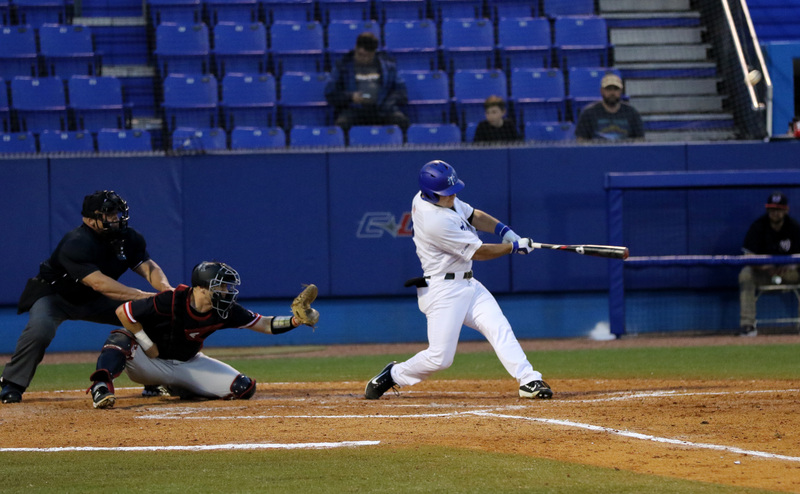 Foul trouble, which hurt the Blue Raiders in their season opener at Virginia, was a problem again. 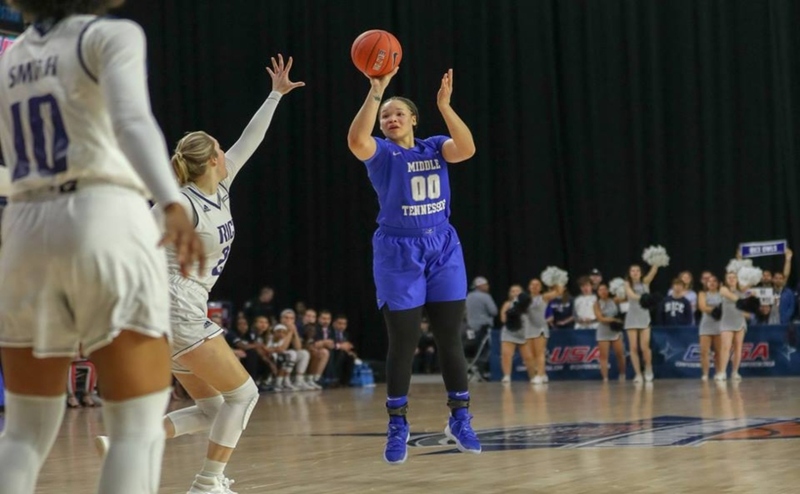 By the time the halftime horn sounded, Reuter and Alex Johnson were both saddled with three personal fouls, while Gabby Lyon, Jess Louro and Jordan Majors each tallied two. The Cardinals came out with all the energy in the second half and ran the lead up to 21 points by the end of the third quarter. Ty Petty was the biggest bright spot for the Raiders, scoring a career-high 27 points and dishing 11 assists. While happy with the accomplishment, Petty was adamant after the game that she cared more about winning the game. “I would definitely trade the win for the points, but I just did whatever I had to do for my team,” Petty said. Alex Johnson was the only other Lady Raider to finish in double figures with 13 points. The height and athleticism of Louisville played a factor in her performance, as she was held to only one rebound. “Every time I come out on the floor, I’m usually one of the most undersized posts there is,” Johnson said after the game. Despite facing a team that many believe will contend for the national championship, Coach Rick Insell was proud of his team’s effort. They outscored Louisville in the fourth 23-21 and cut the lead to 13 at one point. 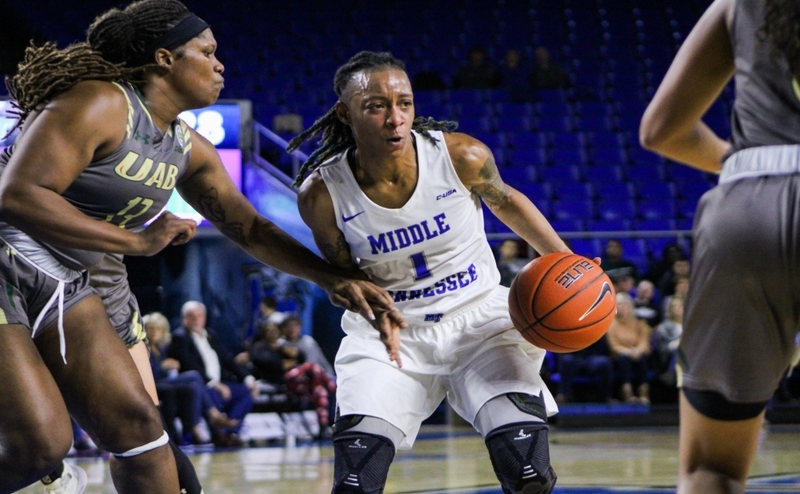 The Lady Raiders will travel to Cookeville on Saturday to take on Tennessee Tech; tip-off is set for 6 p.m.